← Will employers’ gender pay gap figures tell us anything new? Ultimately, the long-term answer to this problem lies in reducing the number of migrants who are crossing into Europe from Africa. Many see Europe, and particularly Britain, as somewhere that offers the prospect of financial gain. This is not the case – our streets are not paved with gold. We must help African countries to develop economic and social opportunities so that people want to stay. We must work with those countries to fight illegal migration and allow people to be returned to their home countries more easily. This means a better targeting of development aid and increased investment. All good intentions, of course, but the trouble is, ‘paved with gold’, at least in this sense, is a relative term. The gap between income levels in Africa and Europe is massive and is likely to be so for some time. And here’s the rub; as Africans get that bit richer, more of them are likely to try their luck. That might sound counterintuitive but it makes sense when you think about it. The increase in per capita incomes in African countries, while not doing much much to close the gap with Europe, give people the extra resources they need to emigrate. As Paul Collier said, the relationship between income and propensity to migrate is like an inverted U. The poorest would like to migrate but can’t afford it, the richest can afford it but wouldn’t gain much. It is those in the middle that have both the incentive and the means. A fascinating report from Senegal in the Wall Street Journal found that the country’s increasing prosperity is not encouraging people to stay at home, it is enabling more of them leave. But it has also put European living standards on real-time display, and handed young farm hands the cash to buy a ticket out. They leave behind a proud democracy whose steady economic growth has brought American-style fast food chains, cineplexes and shopping malls to this nation of 15 million, but hasn’t kept pace with the skyrocketing aspirations of the youthful population. The flat-screen TVs raise expectations and the computers and mobile phones give access to information about how to get to Europe. West Africa houses several of the world’s faster-growing economies but is also sending some of the most migrants out. One of the more intriguing nuggets about the Africa emigration story is that far from fleeing poverty, migrants out of the continent are likely to be relatively well off, and are rarely from the most destitute families. Data from the UN’s World Migration Report shows that African emigration rates to the OECD countries are strongly related to GDP per capita, and to household wealth, as these migrants are more likely to have the resources to pay for transport to and resettlement expenses in the OECD countries, and are more likely to have the education and other skills required to find jobs there. The journey across the Sahara desert and over the perilous Mediterranean costs anything between $1,000 and $3,000, and often, payment is strictly in advance. Research suggests that most people want to emigrate not because they are poor, but because their reality does not match up with their aspirations and what they expect to get out of life – it’s a relative, rather than absolute, dissatisfaction. Research by UCL’s Centre for Research and Analysis of Migration found that the probability of migration increases in line with household wealth in Asia and Sub-Saharan Africa but decreases in Latin America, reflecting that region’s greater per capita incomes. For most of the world, the richer people are, the less likely they are to migrate. In Africa and Asia, though, a certain level of wealth makes people more likely to migrate because they have the means and access to information. 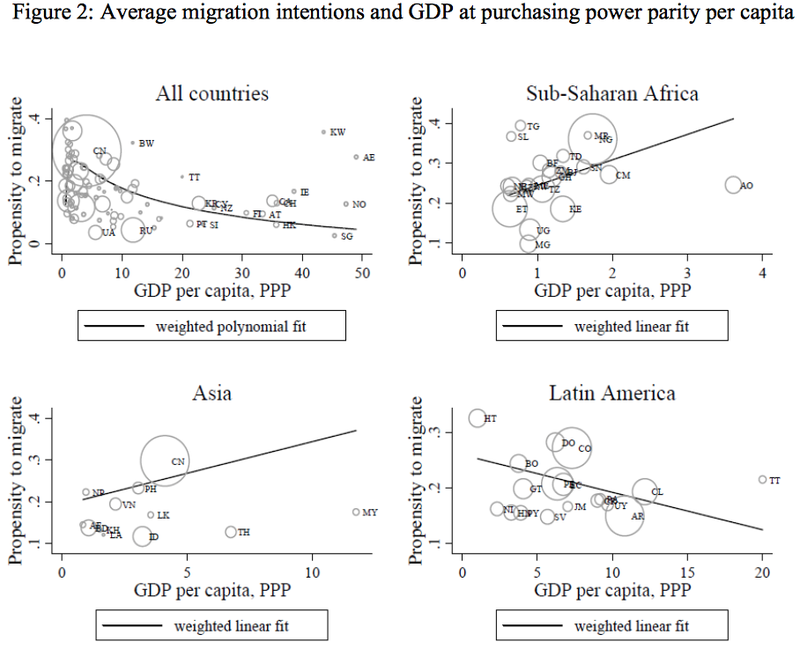 Our findings conform remarkably to the predictions of our simple model: whereas migration probabilities decrease in Latin America (the richest region), they increase with the individual wealth index in Africa and Asia. The association between migration intentions and various dimensions of local amenities (e.g., contentment with public services, security), however, is negative for all regions. That last point is important. Security and good government makes people less likely to migrate and the lack of it makes them more likely to do so. But cheaper travel and instantly available information about the world outside means that people are able to flee oppressive regimes in greater numbers. In Syria and Iraq, for example, outbreaks of violence against Christian minorities are nothing new. Despite their troubles, the Christian populations hung on. They had nowhere else to go and few had the means to escape. In contrast, the sectarian violence of the last decade or so is likely to spell the end of Middle-Eastern Christianity. Where once people might have stayed and fought back, or died trying, they now emigrate. Communities that have existed for two thousand years look set to disappear within decades. Last year, Syria accounted for the most migrants attempting to cross the Mediterranean. So far this year, according to the Economist, most Mediterranean migrants have come from Gambia, Senegal and Somalia, which illustrates the multi-faceted nature of the migration. Some of it is political, some of it is economic but all helped along by cheaper travel and more widely available technology. Eventually, there may come a time when the wealth gap between Europe and Africa is reduced to the point where people no longer feel the need to migrate. That is unlikely to happen for many years though. In the meantime, as Africa gets richer, more people will have the knowledge and the means to migrate. The streets of Europe will still be paved with gold and more people will have the wherewithal to go looking for it. As Christine Mungai said, expect more overcrowded boats. Do this mean that we should stop paying foreign aid as it is a home goal. Does this mean that we should stop paying foreign aid as it is a home goal? This is an interesting point, but apart from clarifying expectations of the short-term impact of foreign aid does this change the argument for it being required? Logically the choice this presents is either to accept the short-term boost in migration on the way to the long-term closing of the wealth gap or to accept that we are deliberately maintaining as wide a gap as possible, i.e. keeping the poor poor so the rich aren’t inconvenienced. So, to answer Truth to Power, we should only stop foreign aid if we think it is morally acceptable to keep living standards low for the poorest peoples in the world to maintain our standard of living. In 1982 the UK became involved with a conflict with Argentina over the sovereignty of the Falklands Islands. This was rapidly resolved by our armed forces who had a clear ‘end game’. The ‘end game’ must always be clearly articulated before entering into a war or crisis. In 2001 the UK and US became involved with the Afghanistan War, ‘Operation Enduring Freedom’, and again the ‘end game’ was not clearly articulated. This resulted in problems. In 2003 the UK and US became embroiled in a war with Iraq, ‘Operation Telic’, again the ‘end game’ was not clearly articulated. This resulted in more problems. With pressures on the defence budget the government paid money into Foreign Aid i.e., ‘soft defence’. The world is a system of systems, or possibly a complex system. We see that war perturbates stable sub-systems … often producing unpredictable results. As Rick has observed here the interventions in foreign countries using aid (‘soft defence’) also produces unpredictable results. I personally believe that we should transfer the monies currently paid into ‘soft defence’ to ‘hard defence’ so that our homeland is at least properly defended, and we should stop interfering in the business of other countries … unless we have a clear ‘end game’. Socialists try to change the world by using social engineering. We have seen such practices in communist countries, Nazi Germany, and ‘New Labours’ the ‘Third Way’ and usually end up as spectacular disasters. Social engineering is immoral and generally does not work. The problems that we see today are a consequence of someone’s ‘social engineering’ experiments. In this case the UK is waving pound notes in front of the world and so those people believe that our streets are ‘paved with gold’ … we know that that is not true … so stop waving them. It is immoral to mislead these people by giving them hope which we cannot deliver. You may be watching the BBC2 Giles Coren series ‘Back in Time for Dinner’ which is taking a family back to take a historical view of UK life from the 1950 to the present day. To that family life in the 1950’s looked grim, yet someone living in that time would have been perfectly happy. If they had been able to look forwards to 2015 they might have been envious of modern life. If the modern family had been able to change life in the 1950 I’m quite sure that they would have like to have improved 1950’s life, however, would it be moral to do that … I’m not sure that interference would be moral. As Rick states it is all ‘relative’. This is analogous to comparing life within Africa and the UK. The Africans who would like to move to the UK are the people who would bring about change within their communities in Africa. By accepting them here damages the development of those African communities … I say that would be immoral. Socialists may see things differently, however, we have problems at home and most certainly cannot change the world. In countries like India these ‘soft defence’ monies end up by funding their space programme, and in other countries funding crime. The best that we could do is to convert them into democracies, and install governance, but wasn’t this what the British Empire tried to do. That is a very good point. I suppose a simple example is the fact that western countries like importing foreign doctors and nurses. So your best ticket out of there is a qualification as a doctor or a nurse (paid for by your country). To talk about foriegn aid as a “home goal” is to subscribe to the paradigm of international competition (the “global race” and similar guff), in which our objective should be to beat the other lot by maintaining our first-half lead, having plundered their resources in the opening minutes. This is zero-sum nonsense. Foreign aid is pursued instrumentally as a means to leverage trade and resource concessions. It’s a win-win, though the gains are usually greater for the donor than the donee (due to the asymmetry of power). It’s also best thought of as an investment, not only because it produces commercial gains for UK companies, but because it opens up employment opportunities for UK citizens: charity workers in the Gambia, petroleum engineers in Nigeria etc. The contradiction at the heart of conservative policy (and I include the French Socialist government in that category) is that minimising migration between nations means minimising free trade. The last large-scale experiment that attempted to expand trade while minimising migration was the clumsy arrangements between the EEC and Eastern Europe. You can’t have free trade without migration (despite the delusions of UKIP and others), any more than you can have trade without the spread of infectious diseases (hence the ready equivalence of migrants and pathogens, or other irritants such as “swarms”). As Adam Smith et al noted, less trade means a lower level of wealth all round. A very interesting perspective and I shall give it some thought, however, I’m not at all sure that the purpose of ‘Foreign Aid’ is ‘Trade’ I am more inclined to believe that it is a form of ‘Soft Defence’. All parties are full of contradictions … what you need is honesty and integrity but politicians don’t have much of that. that is why Corbyn is doing so well he appears to be honest and have integrity as does Ferage. I find it hard to understand why you believe that ‘minimising migration between nations means minimising free trade’. That is not what free trade is about … you can have free trade of currency, however, you don’t need to trading the people. People seem to be jumping up and down about the use of the word ‘Swarm’ but I am sure that you must realise that according to the Oxford English Dictionary it also has the meaning ‘A large number of people or things: ‘a swarm of journalists’’ which is a valid use of that word. The free trade in goods between nations requires transport. Over time, expansion in trade volumes will lead to a falling unit cost in transport, which makes migration cheaper and therefore more attractive. Rick has emphasised growing disposable income in this post, but falling cost is as much of a factor. We currently hear a lot about migrants paying thousands to be ferried over the Med, but the bigger story is that the average cost of migration is falling globally, which is a primary reason why the number of migrants is increasing. On many trade routes, people become a commodity that can be used to avoid wasted transport capacity – e.g. Atlantic ships that transported bulky primary goods from the US to Europe in the 19th century, and which could not fill their return capacity with finished goods (partly due to US tariffs), turned to immigrants (in demand in the US) as cargo. Much of the increase in migratory numbers within Europe is due to the growth of low-cost airlines. If a plane ticket from Warsaw or Riga to London still cost hundreds of pounds, there would be fewer Polish and Latvian builders in the UK. While the free trade of currency (i.e. capital) can be done electronically, the purpose of capital trade is to invest in productive capacity that will usually lead either to the trade in physical goods (e.g. UK capital is invested in a Chinese factory that manufactures goods shipped to the UK) or the trade in services that encourages movement (e.g. holiday complexes in Turkey result in more cheap flights). Trade of any sort leads to more physical movement of people, both as a factor of production (i.e. migrant labour) and as a facilitation of trade (i.e. business trips). More movement leads to lower transport costs, which encourages more migration. Bottom line: increased free trade means increased migration. The differences lie within the metalanguage. This has two sub sets; ‘national trade’, and ‘international trade’. Which we shall not discuss. Free trade is the simpler of the two theories: a laissez-faire approach, with no restrictions on trade. The main idea is that supply and demand factors, operating on a global scale, will ensure that production happens efficiently. Therefore, nothing needs to be done to protect or promote trade and growth, because market forces will do so automatically. In contrast, protectionism holds that regulation of international trade is important to ensure that markets function properly. Advocates of this theory believe that market inefficiencies may hamper the benefits of international trade and they aim to guide the market accordingly. Protectionism exists in many different forms, but the most common are tariffs, subsidies and quotas. These strategies attempt to correct any inefficiency in the international market. You speak about ‘Capital Trade’ which you describe as being UK business manufacturing abroad to take advantage of the cheap labour within those countries. This is potentially a very positive thing to do as if properly regulated creates a win-win relationship. This seems to be off subject. So what you are referring to is ‘International Trade’ and not ‘Free Trade’. Transportation costs certainly do influence the viability of trading certain ‘physical products’, in a different way to the trade of ‘virtual products’ such as currency, computer software, and services such as call centres. Historically shipping agents would want to sail their ships fully loaded in both directions to obtain a near 100% utilisation of the cargo space and this may have been a factor that lead to the growth of the ‘slave trade’. Modern ships do not usually transit point to point. Shipping agents plan routs to maximise the utilisation of cargo space. Other factors such as the cost of ships, fuel, also influence the shipping costs. The relationship between ‘trade and transport’ is rather like the ‘chicken egg’ relationship. Other factors affecting ‘international trade’ are skills, wages, control and legislation (health and safety), taxes and exchange rates. Historical relationships are interesting, however, making such comparisons are rather misleading … the world has changed and has become more complex. Within our modern world the linkage between ‘international trade’ and ‘migration’ is tenuous … we are dealing with ‘complex systems’ so to gain proper understanding you would need to model that system. If those Mediterranean boats were used to import goods to the African continent then perhaps the journey to Europe may provide a cheap form of transport. Unlike yesteryear we have quite strict maritime laws and control of what enters and leaves European maritime boarders. If a ship enters a European port and is deemed to be unsafe it is subjected to inspection, and would be prevented from leaving, and possibly confiscated, unless made seaworthy. The flow of people into Europe is through smuggling rather than being directly linked to trade, or legal shipping. Rick is right that they have become richer allowing them to travel, however, the situation is rather more complex as instead of jumping onto cheap airlines, they are paying exorbitant amounts of money to criminals. The recent interviews of Camila Batmanghelidjh (Kids Company) were interesting. One sensed that she believes that she has a natural right to spend taxpayer monies to pursue her personal ambitions, rather than develop a sustainable solution to the problems. It is as though they are searching for a socialist utopia that does not exist and would lead to certain oblivion, rather like that being sought by the migrants. About the subject of Christianity and other persecuted minorities in the Middle East, has anyone read the book Heirs to Forgotten Kingdoms? I HIGHLY recommen it. And, given that these societies were so dominated by priests and so rooted in their locality, it’s tragically as impossible to recreate them as it is to recreate Palmyra. What in the name of buggery were they thinkng when they launched the illegal war in Iraq, and what goes through the skulls of people who seriously think of electing a Rethug president in America? Though Clinton H is barely better. I dispute the right-wing concern trolls who say this country shouldn’t be “poaching” doctors and nurses who should be healing deeper wounds in developing countries. It sounds so good, a way of reconciling compassion with being a right-wing twunt, until you think about it. The prosperity created by remittances (trade being a far better key to prosperity than government aid programmes) allows more professionals to be trained in th hope of coming here. Which most won’t actuallly do, they’ll stay at home and contribute more. It is all a minefield and I’m rogered if I know. Initially it sounded like you were implying that African nations would have to increase per capita income to the level of European countries, but looking at the graphs I see that an increase to the level of Latin American countries might do the trick. The US experienced a decrease in illegal immigration during the 2007-2009 economic crisis, without US incomes falling to the level of Mexican incomes. Mexico has its own border problems with Honduras, but it’s not just because Hondoran immigrants are passing through to get to the US. Many of them choose to stay in Mexico because it’s safer and wealthier than Hondoras. Increasing per capita incomes in north African countries might be an important piece of decreasing the rate of illegal immigration from all over Africa. On the other hand, do you really not want these ambitious Senegalese college students? I am the founder of Blackworld.com a Media and Technology platform aiming to connect the world with Africa and its global diaspora communities as they rise economically, therefore I feel I can lend some insightful perspective to this interesting article. I am British born and raised of Nigerian parents and had an opportunity to experience living in Nigeria, South Africa and extensively in California where I initially launched my startup. The problem with the perspective in this article, is it is skewed in favour of macro migration economics. On a micro level, if you carry out deeper research by talking to a lot of middle class Nigerians for instance, you will find out most of them actually prefer to migrate to the United States and have been doing so for the last two decades at the very least. Another insight is, Nigerians generally see the UK as their ” second home ” historically, it runs very deep in their psychic for generations. For instance, my foster parents in England and those of my cousins were all white english, helping bring up British Nigerian born kids while our parents studied at various university institutions in England. Most of those parents actually went back to live in Nigeria, have done extremely well for themselves and most have no desire whatsoever to settle in the UK, however, they still see the UK as a second home. For example, my father, uncles and aunties are all mostly happily settled in Nigeria as highly skilled professionals or entrepreneurs with second homes in the UK, United States or elsewhere in Europe and most recently expanding their assets to Dubai. The Africa is rising narrative albeit fundamentally flawed, is also creating another shift, where the diaspora of Africans are seeking business and career opportunities in Africa. Also, Europeans with a savvy startup mentality are beginning to seek business opportunities across Africa, e.g Rocket Internet of German origin are expanding several startups aggressively and they are recruiting highly educated Africans from the United States and the UK, to work for their flourishing startups in Africa. IBM, GE, Google, Facebook and several others multinationals are doing the same. Startup ecosystems are evolving in partnership with Europe all over Africa. My experience of living in South Africa, revealed most black middle class South Africans have no desire whatsoever to emigrate to Europe, only a small minority want to do this. A lot of my white South African friends have moved back to South Africa after living in London for a few years. Its the same across other Southern African countries. Probably because their communities are a lot more stable and developed. West Africans however are far more likely to travel the world because they are exploring economic benefit through trade, education and indeed permanent emigration a times. However you have to be careful suggesting most middle class West Africans want to settle in the UK or Europe. That is really not the case if you are doing very well and have exploited the Africa is rising narrative. I would argue most of the Africans who are coming to Europe to settle, are the economically dis-enfranchised. The article is however correct in asserting Europe can help Africa in terms of good governance, respect for human rights and corporate transparency. Indeed such an effort will dis-encourage unnecessary migration out of Africa over the long run. The near future as we see it on Blackworld.com is this… if the European forecast research is correct through the likes of Renaissance Capital, a London Investment Banking firm, Merrill Lynch, the UK Observer and several other research groups, then Africa should gradually rise towards a $30 Trillion economy by 2050 starting from yesterday. This exponential growth, albeit all its contrasts and contradictions means growth in Africa will continue, and it will need to attract an infinite number of skilled professionals throughout the Africa Diaspora and indeed Europeans, Asians and Americans who want to exploit this growth opportunity going forward. For instance Portugal has experienced a significant brain drain of over 100,000 skilled professionals going to work in Mozambique and Angola over the last 5 years alone! A lot of these Portuguese nationals are doing very well and are settled in Africa. You may find this hard to believe, but I strongly recommend the UK should start encouraging our young aspiring British nationals to seek new career and business opportunities across english speaking Africa. That should be our long term strategy in the UK, to compete effectively with China and India who are already doing this. What you are going witness is a reverse emigration out of Western and Eastern Europe to Africa, simply because that is where the new career and business opportunities are going to evolve over the next 5 decades from today. Africa is going to experience a wave of global immigration, just like America did over the last 100 years. Everything needs to built and organized to achieve the forecast of $30 trillion by 2050. Can the UK really afford to miss out on this opportunity? Human beings regardless of background will seek out new opportunities once they learn where those opportunities really are. Therefore, instead of us banging on about massive immigration to the UK, we should start encouraging young UK professionals and academics to explore all the opportunities Africa now has to offer. This you might call a 3rd wave of European participation in Africa, however under more ethical, altruistic and egalitarian lines, in an open connected world with superficial borders. Ultimately economic rewards will filter back to the UK as these young professionals help build Africa through skills transfer and startup entrepreneurialism. We’ve noted for instance certain wealthy Angolans are re-investing Portugal as they increase their wealth. To help with skills transfer and recruitment, Blackworld.com will be launching a 24/7 Virtual Global Recruiting platform in September 2015, called Africa Career Fair. There are significant career opportunities for everyone if we work together and help towards Africa’s future development. So while I empathize with Paul Colliers’s perspectives during his open debate at the Oxford Union this week, I feel there is a generational thinking gap in his fundamental understanding of what is really happening with immigration to the UK. People need to understand London is now considered the world’s capital city and it is heavily marketed that way, therefore inevitable immigrants right across the board, rich or poor. The world has truly changed Sir Paul. The Obama Administration now gets it, China already got it, India always got it, Germany and Portugal are fronting it for Europe…does the United Kingdom get it? Is this why the migrants seen on tv are well dressed – or have they been provided with clothing on arrival? Never saw it that way but now it makes sense.Though you have used West Africa as the main example;other African countries also experience the same despite economies showing enormous potential for growth.Most Africans still do not want to tap in to this and create enormous wealth which they would never achieve even if they lived in Western countries.Most industries and sectors in African economies have just started and have reached their maximum potential and just wish more Africans see this!